Group of Officers of the 316th Station Hospital (England), probably taken in 1943, before Colonel Marcellus A. Johnson, Jr. left the unit. Front row: 1st Lt. Simon J. Conrad (MC), 2d Lt. Sal F. Marino (MAC), 1st Lt. George A. McCoy (MC), WOJG Donald T. Dierkes, Sr., Capt. Nelson C. Policastro (MC), Col.
Albright (DC), Maj. Olav Kaarboe (MC). Second row: 1st Lt. Francis R. Fechter (MC), 1st Lt. Irving B. Block (MC), 2d Lt. John S. Peacock (MAC), 2d Lt. Robert M. Wells (MAC), 1st Lt. Kenneth C. Martin (ChC), Maj.
Arsdall (MC), 2d Lt. George W. Westphall (MAC). Third row: 2d Lt. Eldon C. Rosegart (MAC), 2d Lt. Charles F. Harper (MAC), 1st Lt. Walter C. Denman (DC), Maj. Dominic A. Campisi (MC), Maj. William H. Hughes (MC). The 316th Station Hospital was activated at Cp. George A. White, near Medford, Oregon (US Army Division Camp, 49,638 acres, troop capacity 1,884 Officers & 35,557 EM, construction initiated 25 Feb 42, dedicated 15 Sep 42). Activation was based on General Orders No. 37, Headquarters, Ninth Service Command, Ft. Douglas, Utah. The unit’s first CO was Colonel Robert E. Thomas. Cp. 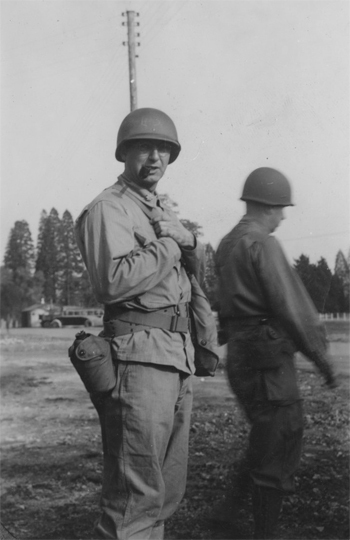 White trained the 91st & 96th Infantry Divisions in WW2, as well as a number of Engineer, Medical, and Artillery units between 1942 and 1945. These would include the 23d and 24th Field Hospitals, the 79th – 80th – 81st – 83d General Hospitals, the 316th and 318th Station Hospitals, and the 41st – 42d – 44th and 45th Portable Surgical Hospitals.Beginning late 1943, a first group of German PWs were held at the Camp. The Hospital received its “alert” orders on 20 August 1943, and after careful planning and organization started the long trek to the E.T.O. on 22 August 1943. A long troop train trip across 15 different States would be required to reach its Staging Area on the east coast. After arrival at Cp. Kilmer, Stelton, New Jersey (Staging Area for New York Port of Embarkation, 1,815 acres, troop capacity 2,074 Officers & 35,386 EM –ed) on 26 August 1943, another roll call was held; the Hospital now numbered 44 Officers, 75 Nurses, and 392 Enlisted Men, all ready for service overseas. Transportation would take place aboard RMS “Mauretania”. Before boarding, troops were subjected to lifeboat practice, abandon-ship drill, physical check-up, dog tag inspection, clothing and equipment check. Luckily for the men and women of the 316th, passes were obtained to visit nearby cities. The overseas saga of the 316th Station Hospital technically began on 12 September 1943as soon as the ship crossed the three-mile limit off the coast of New Jersey steaming eastward into the Atlantic Ocean, the moment when foreign service pay commenced for its personnel. After an uneventful 7-day Atlantic crossing, the RMS “Mauretania” arrived off Liverpool, England on 19 September 1943. 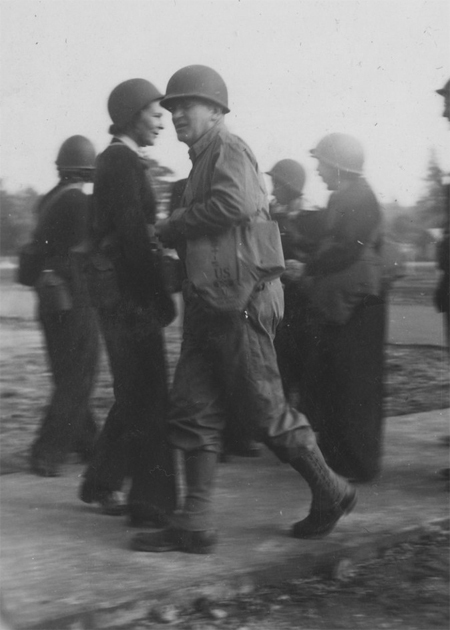 Colonel Marcellus A. Johnson, Jr., MC, O-449552, Commanding Officer of the 316th Station Hospital (1 April 1943 > 29 July 1944) during a conditioning road march. Picture taken during fall/winter of 1943-1944. At 2100 hours the same day, the first contingent of 316ers boarded a troop train and headed southward past the blacked-out border of Wales under the supervision of First Lieutenant Robert M. Wells, MAC, who had come over with a 5-party advance detachment in August to prepare the way. The first station, one of the finest medical installations in England to be occupied by the 316th Sta Hosp was a forty-acre area between Bovey Tracey and Newton Abbot, in the County of Devon, locally known as “Camp Stover”, where it set up in a British-built brick construction. Ten miles southeast was the resort harbor and installation of Torquay; while twenty-five miles southwest lay the blitz-mauled seaport of Plymouth. Because Devonshire was a scene of massive Invasion maneuvers throughout the fall and winter of 1943, the need for additional US Hospitals, such as the 316th Station Hospital was a vital and realistic one. From the very first day of its tenancy, 20 September 1943, the commissioned and enlisted personnel of the organization buckled down the vast amount of preparatory work in hand. Picture of Major Dominic A. Campisi, MC, O-356675, Chief Orthopedic Section, Surgical Service (facing camera), and Captain Elmer J. Olson, MC, O-1684338, Medical Service (back to camera). Picture taken during the same conditioning road march. Officers and men went promptly to work, surveying the jobs to be done, the available equipment, and the countless problems – big and small – which were inevitable in the task of outfitting and organizing a large medical installation. The Hospital, British-built, was excellently planned and attractively laid out. Buildings of brick construction, with corrugated fireproof roofing, were used throughout by the new tenants. Floors were of concrete, all windows were equipped with anti-shatter gauze against potential bomb blasts, and provided with efficient black-out facilities. The wards were laid out in a symmetrical pattern with a 30-bed capacity, of which 12 were designated for surgical cases, and 14 for medical cases, including the necessary isolation wards. Two large VD wards, with attendant mess facilities were built 500 feet away from the main plant. There were 3 mess kitchens and dining halls, adequately equipped with refrigerating and cooking equipment, for patients, Officers, and Enlisted Men, respectively. 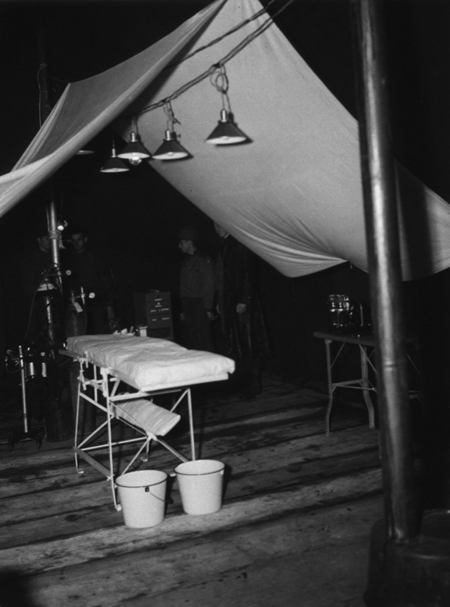 Living quarters for Officers, Nurses, and EM each set up in separate areas were roomy and well-ventilated. There was an ample supply of hot water piped above ground to all sections of the Hospital but no central heating. Coal stoves of varying sizes and degrees of efficiency were used throughout (fueled with cokes under Reverse Lend-Lease), with coal only available for essential purposes, such as warming the mess department. During the initial phases of medical installation, non-technical groups were also busy. A building formerly designated as a Patients’ Recreational Hall was re-organized to serve as the “Dizzy Dice Theater”. Working in cooperation with the Salvage Office of the City of Plymouth, scrap material was obtained for construction of a large stage, requested by the Special Services Section. Red Cross materials were provided to make curtains, cyclorama, and flies. Stage lights were installed and painted signs and plaques embellished with the Caduceus and the Army Service Forces insignia prepared. Within a month after arrival, a radio had been installed in every ward, and athletic equipment, games, reading matter, a piano, and 400 folding chairs had been obtained or requisitioned. Motion pictures could now be projected twice weekly (later 6 times weekly). Live entertainment (both USO and ENSA) was brought to the Post every other week. A large Officers’ Club, a Sergeants’ Club, and an Enlisted Men’s Club were installed and well-decorated, providing many social functions and offering beer and soft drinks at advantageous prices. A 5-man dance orchestra, the “Jive Five” was organized among the EM, under the “baton” of CWO Donald T. Dierkes. The band played for all dances given on the Post, and its services were much in demand at various functions sponsored by Allied Forces stationed in the South Devon area. A roomy chapel was opened for religious services by First Lieutenant Lewis W. Williamson, Protestant Chaplain and Captain Kenneth C. Martin, Catholic Chaplain, shortly after arrival. This building would become the center of Christmas activities later on. Under supervision of Miss Elizabeth Donnellan, A.R.C. Assistant Field Director, a ward was furnished and decorated as a Day Room, including a hobby workshop, a games and music room, and a large, well-stocked library for the use of ambulatory patients and enlisted personnel. The American Red Cross also brought many movies, stage shows, doughnut wagons, and ward entertainers to the Hospital. Officers and Nurses of the 316th Station Hospital prepare for a 5-mile hike. Picture taken in early fall of 1943 in England. Not provided within the T/O for a 750-bed Station Hospital, was the necessity for a Military Police Platoon to maintain guard on the installations at all times, the organization of a full-time Fire Department (using British equipment), a Post Exchange staff, and motion-picture projectionists. Other activities added to the Post were a two-chair Barber Shop, a Carpenter Shop, a Tailor Shop, and a Utilities Department (working together with the Post representative of the Royal Engineers). Finally on 25 October 1943, the 316th Station Hospital officially opened in the Southern Base Section (SBS) as a 834-bed unit. With the first influx of patients, sick and wounded, came inspections by ETOUSA and SBS officials, and consistently the 316th maintained a “superior” rating at all times. This was primarily due to the high standards of sanitation, efficiency, and discipline set by the C.O. and by the close-knit cooperation he received from all members of his command. 25 December 1943, Christmas Day at Camp Stover, Southern Base Section, United Kingdom. Partial view of decorated ward. The early part of 1944 found the Hospital servicing American Forces of all branches and services engaged in large scale pre-Invasion Maneuvers in the region. On 10 January 1944, the 736th Medical Sanitary Company, comprising 60 African-American EM headed by First Lieutenant James D. McDowall, MAC (CO) and Second Lieutenant Ellsworth B. Nowell, MAC (XO) was attached to the Hospital (the unit would remain with the 316th Sta Hosp until 27 May 44). The colored troops not only assisted with construction, landscaping, and labor details, but also participated in the “Dizzy Dice League” baseball games organized in spring. Valuable assistance in leveling the adjacent fields was given by the 392d Engineer Combat Battalion stationed nearby. Throughout 1944, the Hospital staffed and maintained a Medical Dispensary at Newton Abbot, and at various times sent Officers, Nurses, and Technicians on DS to numerous fixed and field units (Newton Abbot housed a number of colored units, such as Headquarters & Headquarters Detachment 386th Port Battalion, 214th Port Company, 215th Port Company, 216th Port Company, and 3197th Quartermaster Service Company). In March 1944, the Mess Department conducted a Cooks and Bakers School, supervised by Second Lieutenant Eldon C. Rosegart, MAC. As a result 42 qualified cooks and bakers graduated between 24 March and 26 April 1944. In April 1944, the 28th and the 92d Medical Hospital Ship Platoon were quartered and messed on the Post. In addition to its regular garrison and hospital functions, the Hospital contributed its full share in the stepped-up tempo of Allied preparations for the D-Day operations and offensive. This included an important expansion plan of the unit’s medical facilities. Acting on SHAEF orders and in preparation for possible high casualties in the forthcoming invasion of the continent, the 316th Station Hospital erected 48 ward tents and 12 latrine tents, each which concrete-block floors, expanding the unit’s capacity to 1,554 beds! A daily news bulletin, the “Mediclarion” was issued by the organization, giving world war headlines, home front news, and Post news. Picture illustrating some ANC residents of the Helzapoppin’ Nurses’ quarters at Camp Stover, SBS, England, taken in spring of 1944. 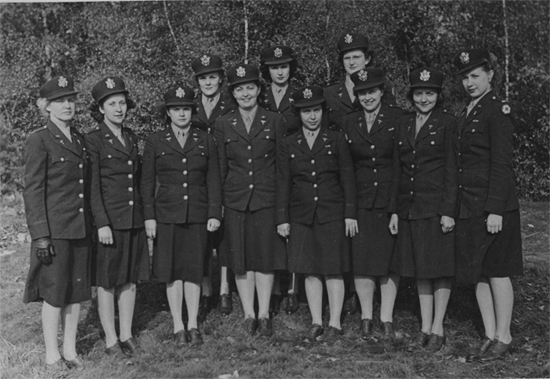 From L to R: 2d Lt. Ruth Martin, 1st Lt. Louise L. McCall, 1st Lt. Lois J. Plaunt, 2d Lt. Lois Pedersen, 2d Lt. Marian D. Case, 1st Lt. Jayne C. Carlson, 1st Lt. Eleanore J.
Boquet, 2d Lt. Marjorie L. Honstead, 2d Lt. Esther E. Bone, 1st Lt. Lorene E. Rempe, 2d Lt. Maxine M. Nelson. Beginning on 26 May 1944, Officers and Enlisted Men comprising 32 Surgical Teams from 53 different medical installations in the UK were sent to the 316th for briefing and specialized training for duty on LST boats. These men occupied special quarters in a tented area living apart from the main personnel (they were to play an important role in the medical treatment of D-Day casualties -ed). During May 1944 the “Dizzy Dice Theater” was further improved by the construction of a permanent motion-picture projection booth, an enlarged stage, and the installation of 248 plush seats loaned by the Plymouth Corporation and built on graduated terraces to provide maximum visibility of the screen from any seat in the house. A 2,000-volume Special Services library (open daily from 0800 – 2100 hours), known as the “Dizzy Dice Den” was improvised out of an unused warehouse and became one of the most popular features of the Post. “Army Talks” sessions were conducted throughout the year under direction of Major Olav Kaarboe, MC. Army Institute correspondence courses were also taken by many interested persons. The Public Relations Office also reflected much credit on the 316th Sta Hosp. According to an official commendation from the Press Chief, Southern Base Section, United Kingdom, the Hospital’s unit correspondent, Staff Sergeant Walker A. Tompkins, was the “star reporter” for the entire United Kingdom supplying 20% of the newspaper dispatches written by all medical correspondents. Having heard SHAEF’s official communiqué about the Invasion, the Hospital was now ready to fulfil its particular mission in the grand-scale assault on “Fortress Europe”. It was not however until the first casualties from the D-Day landings arrived on 11 June 1944, that the unit was confronted with ‘real” war! They were 23 German Prisoners of War, accompanied by armed MPs! The unit was now temporarily acting as a Transit Hospital. Five days later, it was 7 July 1944, the first Hospital Train filled with American battle casualties arrived at the nearby Heathfield Station of the Great Western Railway, and the Hospital settled down in earnest to its real war job. The top number of patients occupying the installation was reached on 30 July, when the Registrar had 819 patients listed. One of the busiest departments was the Eye, Ear, Nose, and Throat Clinic (EENT). Lots of people came in with eye, nose and throat infections, and hundreds more were there for special G.I. gasmask spectacles (attendance reached from 500 to 1,100 monthly). On 29 July 1944, a new Commanding Officer arrived to replace Colonel Marcellus A. Johnson, Jr. (transferred to the 192d General Hospital, APO 63, where he was appointed CO). The new C.O. was Colonel Laurie P. Lind, MC, O-215789, of Portland, Oregon, a WW1 Veteran, and a soldier with a distinguished military record dating from 1940 (former CO 192d Gen Hosp). 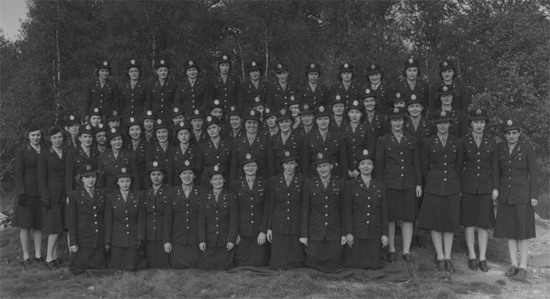 Group of Nursing staff of the 316th Station Hospital (England), taken in spring or summer of 1944. Capt. Rubye J. Duncan (ANC), Crow (ANC), 1st Lt. Matilda A. Janak (ANC), 1st Lt. Carol Smith (ANC). 1st Lt. Ethel J. Johnston (ANC), 1st Lt. Muriel M. Ruddy (ANC), Patnaude (ANC). M. Wahlberg (ANC), 1st Lt. Jayne C. Carlson (ANC), 2d Lt. Marian D. Case (ANC), Hoekstra (ANC). On 15 August 1944, orders from ETOUSA arrived, transferring the 316th intact to the northern part of England. It was to take over the 112th General Hospital plant at Cowglen, Pollockshaws, near Glasgow, Scotland, and remain there for the balance of the year (the 112th Gen Hosp took over Camp Stover). Total admissions exceeded 7,000 patients. Having successfully accomplished the transfer of personnel and equipment, the 316th Sta Hosp re-opened officially on 19 August 1944. September 1944 found the organization operating 2 Hospitals and several Dispensaries: the main body operating a 1,000-bed installation at Cowglen, Glasgow and a Detachment of Officers, Nurses, and EM, operating a 400-bed Holding Hospital at Prestwick Airfield, Ayrshire (ATC air evacuation, intercontinental flights by C-54 from Prestwick, Scotland to Mitchel Field, New York lasted 13 hours -ed). Teams of litter bearers (50 to 150) were called upon from time to time to assist at Gourock in evacuation from Hospital Train to quayside, to lighter, to such ocean-going giants as the “Queen Elisabeth”, “Queen Mary”, “Aquitania”, and others. 20 September 1944marked the First anniversary in the E.T.O. for the 316th Station Hospital, and the experience of having served in several medical capacities, i.e. as a Station, Transit, Prisoner-of-War, and Holding Hospital proving the versatility of men and equipment. Patients treated by the organization during its first year of overseas duty totaled 9,286. On 21 September, in compliance with Movement Order # 163, Headquarters, United Kingdom Base, Communications Zone, APO 871, U.S. Army, the unit assumed full command of the Prestwick Holding Hospital, at Prestwick, Ayr, relieving the 57th Field Hospital. The Holding Hospital was responsible for boarding Zone of Interior patients until air transportation became available. The Hospital’s capacity was 250 beds and the necessary housing for both patients and personnel. In addition to caring for the patients in the Hospital, the staff also attended loading and unloading of planes arriving and departing. Visitors to the Hospital were many and varied, including both military and civilian. Maj. General Paul R. Hawley (Chief Surgeon, ETOUSA), Lt. General John C. H. Lee (SOS) were some of the distinguished visitors. Inspection Teams from higher echelons were equally present, including high-ranking British Royal Army and Navy Officers; prominent British Medical Doctors. British nobility were shown through the Hospital. On 24 September, Queen Marie of Yugoslavia chose the 316th Sta Hosp as the FIRST American Hospital Her Majesty visited in the United Kingdom. She was accompanied by her sons, Prince Tomislav and Prince Andrej, and spoke to the patients in the wards and the assembled personnel in the Post Theater. By the end of 1944, the unit staff strength consisted of 38 Medical Officers, 1 Warrant Officer, 66 Nurses, 1 Hospital Dietitian, 1 Physical Therapist, and 3 American Red Cross representatives. 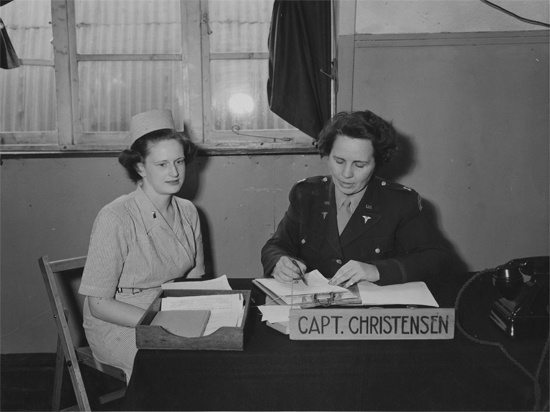 Picture showing Captain Mildred L. Christensen, ANC, Chief Nurse in her office, at Cowglen, Scotland, fall of 1944. Next to her is 2d Lieutenant Marjorie L. Honstead, ANC. During March 1945, the 1364th Labor Supervision Company, with a group of 100 German PWs was assigned to the Hospital to assist its staff with daily operations. Another 100 prisoners were added in May. Many improvements were effected around both buildings and grounds, including building new recreational facilities for the use of patients. Operations at the Holding Hospital, Prestwick were continued. Many promotions were recommended and awarded to Officer and Nurse personnel of the organization. Partial view of the entrance to Camp Stover, SBS, United Kingdom, home of the 316th Station Hospital. The 316th SH was stationed there from 25 October 1943 to 15 August 1944. In accordance with Theater directives, Redeployment and ASR Reports were compiled and sent to General Headquarters, United Kingdom Base. Physical Profiles of all Officers and Enlisted Men were equally accomplished for evaluation. 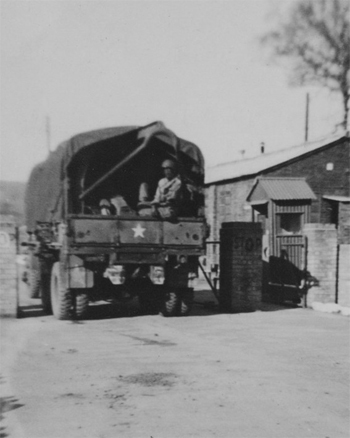 On 30 June 1945, the 316th Station Hospital (APO 437, US Army) was released from the 804th Hospital Center (Whitchurch) and assigned to the 12th Hospital Center (Great Malvern, APO 121, US Army). This Department was removed from the Anesthesia Section to a separate unit for greater efficiency and came under the capable administration of Captain Emmord V. Pyle, MC, O-1689902. During its formation period, Captain Pyle made many trips to various installations to obtain methods and ideas and to build on them the best Central Supply system possible. Early in 1944, the department was in the developing stage and a great deal of work was necessary to bring it up to an adequate level of efficiency. This was done by the staff which consisted of 1 Nurse and 3 Enlisted Men. In the first half year the work largely consisted in making large quantities of surgical dressings, establishing a Blood Bank, and setting up numerous trays for use in the wards. These activities included, blood donor and recipient trays, catheterization trays, IV sets, tidal drainage, and spinal sets. Group picture illustrating personnel of the “Dizzy Dicers”, i.e. the 316th Station Hospital, taken prior to the unit’s move to Scotland (15 August 1944). Note the special unit’s insignia in the center of the photo, depicting a dice with 3-1-6. Engaged almost wholly in servicing the large number of troops stationed in the immediate vicinity, the work was of an emergency nature for the first six months of 1944. During this period, the Burns Service was very active (most burns sustained from gas when using the field ranges). At about 1 June 1944, every patient who could be moved was transferred to a General Hospital in preparation for the expected large number of casualties. However, the first casualties received were German PWs, rescued from torpedoed or sunk E-Boats and Destroyers (this included mostly blast injuries and burns). In all about 75 German prisoners were cared for. It was already 7 July when the first trainload of American casualties arrived and from that time till mid-August the service was extremely active treating shrapnel wounds, bullet wounds, lacerations, burns, abdominal and chest wounds. Many operations were performed for the removal of foreign metal bodies. The patients who could not be returned to duty were evacuated to General Hospitals as soon as their condition would permit. On taking over the Holding Hospital group at Prestwick, personnel became quite taxed in running 2 installations. Being concerned entirely with air evacuation to the Zone of Interior, the unit did not do any major surgery, with any such case being transferred to the parent group. During the first half of 1944, the Orthopedic Service kept fairly busy servicing troops located in the surrounding Marshalling Areas prior to D-Day. Most injuries were of the lower and upper extremities and backs, with an occasional gunshot injury or landmine casualty. It took four 30-bed wards to hold the service under control. The month following D-Day was very quiet until the Service began receiving its first combat casualties, the greater percentage of which were orthopedic cases (mostly compound fractures). The work consisted of improving the alignment of fractures, changing of all casts, and secondary closures. For this, the Service had to expand from 8 to 9 wards. Mixed group of medical personnel including Flight Nurses, Flight Surgeons, Blood Bank Officers, Medical Officers, and Army Nurses. 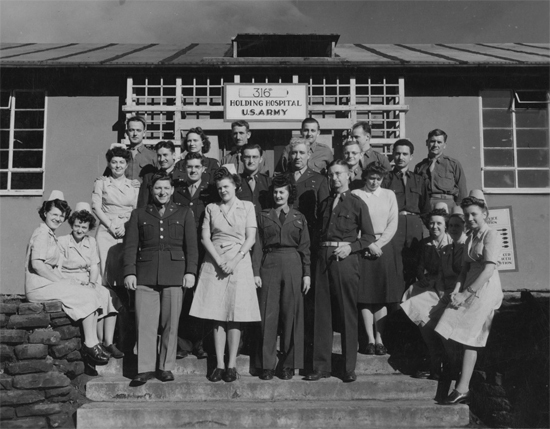 Picture taken at Prestwick Airfield, Scotland, in the second half of 1944 in front of the “Holding Hospital” operated by the 316th SH for air evacuation of patients by C-54 aircraft to the Zone of Interior. The picture also includes personnel of the 811th MAETS (Medical Air Evacuation Transportation Squadron) which operated and manned the airfield unit. The Genito-Urinary Service was occupied mainly by work brought from the large number of troops stationed in the area and consisted of both diagnostic and therapeutic categories. Early casualties were received with bladder wounds and cared for by supra-pubic cystotomies, which required care. In the latter months of 1944, a number of patients developed trouble with supra-pubic catheters requiring corrections before continuing. The Cystoscopic Service, including retrograde pyelography was moderately active in working up cases of hydro-nephrosis, renal calculi, renal tuberculosis, and foreign bodies in the bladder. A considerable number of cases of epedidymitis were also treated. The Outpatient Department was active in a moderate way, mainly dealing with chronic non-specific urithritis, strictures, and chronic prostatitis. During the first six months of 1944, the Service was quite active, serving the other Surgical Sections. 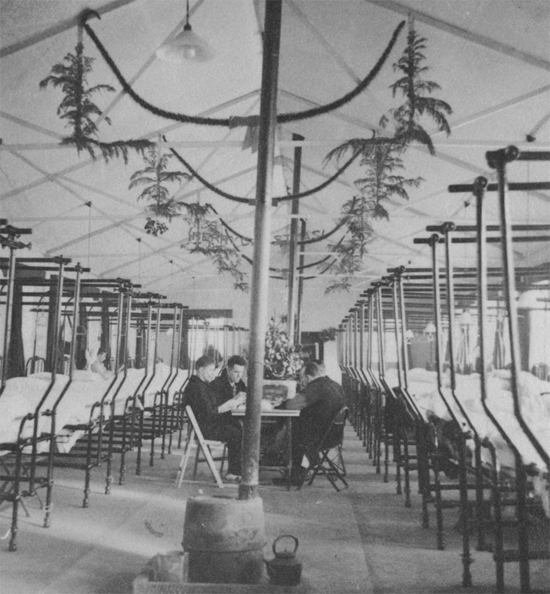 Interior view of an operating tent at the 90th General Hospital. Photograph taken during the unit’s time at Bar-le-Duc, France. During one of the last phases of the war (May – Aug 45), the Headquarters Section of the 316th Station Hospital continued to functionwith the same amount of administrative work as previously, maintaining the high standard of efficiency established in the past. The Hospital Staff consisted of the Commanding Officer, the Executive Officer, the Adjutant, the Sergeant-Major, a Staff Sergeant, and 2 Technicians Fourth Grade. Before the end of June 1945, however, the Staff Sergeant had been transferred to a new organization, reducing the enlisted personnel. In a short time it was returned to a 4-man status by the addition of a Technician Fifth Grade (a clerk-typist). Picture of Major Olav Kaarboe, MC, O-467960, Surgical Service, surrounded by members of the nursing staff taken at Cowglen, Scotland, September-October of 1944. 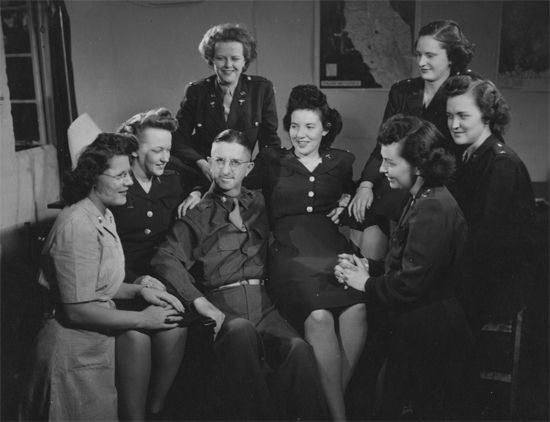 From L to R: 1st Lt. Betty A. Oderkirk (ANC), 1st Lt. Ruth E. Nordstrom (ANC), 2d Lt. Esther E. Bone (ANC), Maj. Olav Kaarboe (MC), 1st Lt. Eleanore R. Grove (ANC), 1st Lt.
Bernice S. Omvig (ANC), 2d Lt. Marjorie L. Honstead (ANC), 2d Lt. Marian D. Case (ANC). Over the period there was a large turnover of personnel to units being redeployed to the Zone of Interior and the Pacific. On 22 May 1945, ASR Scores were established and forwarded to Headquarters, United Kingdom Base for further processing. 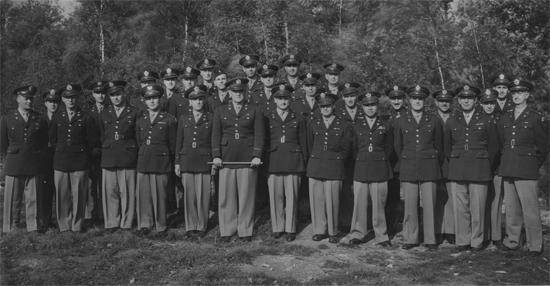 Profiles and Records were updated for all Officers and Enlisted Men of the 316th. It appears that the first movement home must have started late June of 1945. We truly appreciate the assistance provided by Lynn F. McNulty who generously donated a number of historical documents and photographs relating to the 316th Station Hospital, one of the medical units his Father, Captain Frederick J. McNulty (ASN O-526873) served with during World War 2. We would like to thank 1st Lt. Marjorie L. Honstead’s Family and the Kansas State University Library http://www.lib.k-state.edu/depts/spec/findaids/pc2008-02.html for the use of some photos which helped us illustrate this concise Hospital’s History. A complete Enlisted Mens’ Roster and any additional information regarding the official inactivation of the Hospital are welcome and will be appreciated. Thank you.